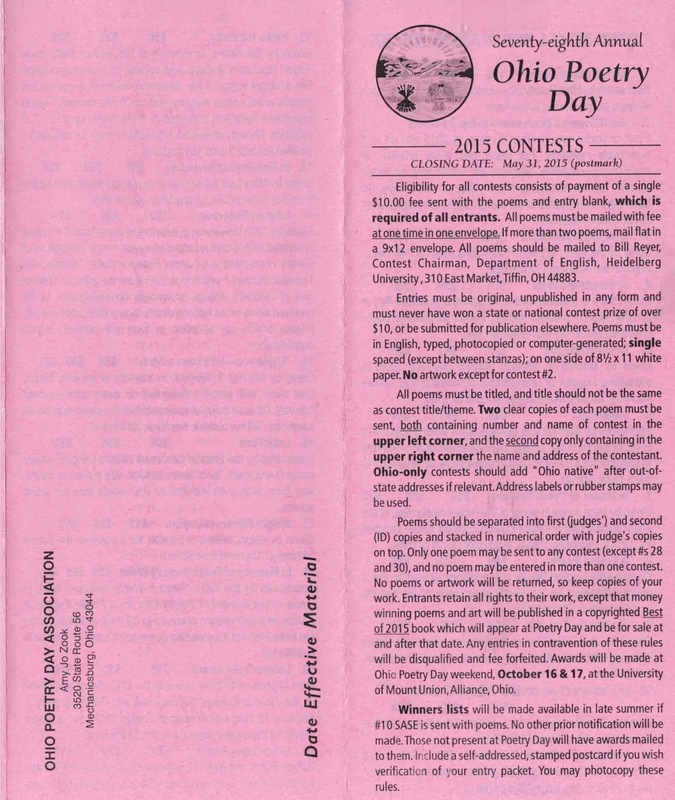 The third Friday of every October is Ohio Poetry Day, and every year the Ohio Poetry Day Association sponsors a series of Ohio Poetry Day Contests, with prizes from five dollars to sixty dollars. This year there are thirty contests, ranging from the annual "I hate you- let's have a drink!" contest, to the Crème de la Crème contest, open only to previous winners, and the Evan Lodge Workshop award, for poetry to be critiqued in workshop on Ohio Poetry Day. Eligibility for all contests consists of payment of a single $10.00 fee sent with the poems and entry blank, which is required of all entrants. (For thirty contests, that's the cheapest entry fee you will find anywhere.) All poems must be mailed with fee at one time in one envelope. If more than two poems, mail flat in a 9x12 envelope. All poems should be mailed to Bill Reyer, Contest Chairman, Department of English, Heidelberg University, 310 East Market St., Tiffin, OH 44883. Entries must be original, unpublished in any form and must never have won a state or national contest prize of over $10, or be submitted for publication elsewhere. Poems must be in English, typed, photocopied or computer generated; single spaced (except between stanzas); on one side of 8 1/2 x 11 white paper. No artwork except for contest #2, the contest for the cover of the annual book. All poems must be titled, and title should not be the same as contest/theme title. Two clear copies of each poem must be sent, both containing number and name of contest in the upper left corner, and the second copy only containing in the upper right corner the name and address of the contestant. Ohio only contests should add "Ohio native" after out of state address if relevant. Address labels or rubber stamps may be used. Poems should be separated into first ('judges') and second (ID) copies and stacked in numerical order with judges' copies on top. Only one poem may be sent to any contest (except "Welcome Aboard" and the "Evan Lodge Workshop Award" ), and no poem may be entered in more than one contest. No poems or artwork will be returned, so keep copies of your work. Entrants retain all rights to their work, except that prize-winning poems and art will be published in a copyrighted Best of 2015 book which will appear at Poetry Day and be for sale at and after that date. Any entries in contravention of these rules will be disqualified and fee forfeited. Awards will be made at the Ohio Poetry Day weekend, October 16 & 17, at the University of Mount Union. Winners lists will be made available in late summer if #10 SASE is sent with poems. No other prior notification will be made. Those not present at Poetry Day will have awards mailed to them. Include a self-addressed, stamped postcard if you wish verification of your entry packet. You may photocopy these rules. --Oh, and mark you calendars for the Ohio Poetry Day itself! This year the celebration is the evening of October 16 (social and workshops) and during the day on 17 (readings and celebrations) at the University of Mount Union in Alliance, Ohio. Cuyahoga Public library's 30 Days of Poetry has published 30 Poems & 30 Poets from Northeast Ohio! Terry Provost, Cleveland, to what shall I lichen thee? If you want to hear some poetry, April's 30 days of Poetry will end with a reading. They're celebrating with Poetry Open Mic @ the Library tomorrow. This open mic is for everyone who writes poetry - and especially those who have been writing this April in response to the Library's daily Read + Write: 30 Days of Poetry. Come read your poem! Sign up to read starts at 6:30 p.m. Please make sure your poem is under five minutes in length and appropriate for a public audience of all ages. 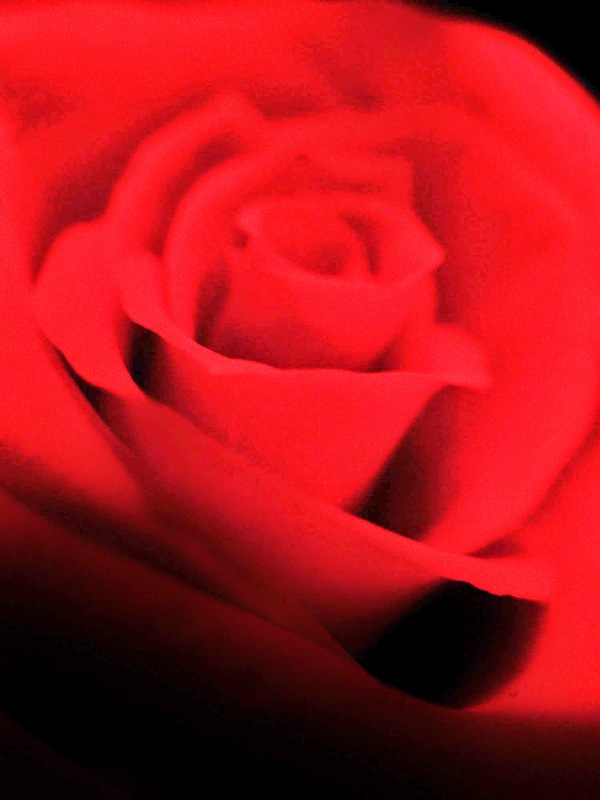 I've been mulling over Susan Grimm's essay, posted last month, arguing that "roses are red" is not a poem; and neither are the works of Shel Silverstein nor Dr. Seuss. I'm pretty sure I disagree. (Uncle Shel? Not poetry? How can it be? )- but it's worth looking at and arguing. What is a poem, anyway? The National Beat Poetry Festival Is Coming to Cleveland! Exciting news! The National Beat Poetry Festival is coming to Cleveland! "The National Beat Poetry Festival, as a non-profit organization, is dedicated to hosting, collaborating, and fostering joint partnerships for Beat themed poetry readings, workshops, plays, radio shows and much more locally and across America...the Beat Generation's significant writings and history of its original prime movers lives on from its inception in the early 1940's, and its legacy continues today by way of new writers, poets and artists of disparate influences and means of expression. The NBFP is committed to not only supporting venues in existence, but also in developing new venues where cultural preservation and the works of new artists can show yesterday meeting the living voices of today. NBFP's activities promote literacy and open exchange dialogue which incorporates the Beat history and art at its base, to break boundaries and bridge cultures with new thought, ideas, and free expression." Events will be happening throughout the month of September in Connecticut, Massachusetts, Indiana, Oklahoma, West Virginia, Long Island, New York City, Kansas City, Pittsburgh, Berkeley, Fredonia, Milwaukee, Minneapolis, Phoenix, Denver, Albuquerque, San Antonio, Baltimore, New Orleans, San Luis Obispo, Chicago, Augusta Georgia, Charlotte NC, Newport News Virginia, Clearwater Florida, Venice California, Posznan Poland, Nigeria, Greece, Liverpool England, Bangalore India, Stockholm Sweden, and Grabserberg Switzerland. New events are added daily! Chansonette Buck spent her childhood "on the road" as stepdaughter of a Black Mountain poet. She holds a PhD in English from the University of California, Berkeley, and has won awards for her visual art, poetry, and teaching. In her poem "back then" from her chapbook blood oranges, she writes about riding in the back seat of the car with her brother and Peter Orlovsky, with Allen Ginsberg and her parents in the front. Alex Gildzen is a poet and artist who uses film as the basis of his work. He entered Kent State University in 1961, and while still an undergraduate had poems published in American Weave and Snowy Egret. He met d.a. levy in 1965; Hugh Fox included him in his 1973 anthology The Living Underground. His book Ohio Triangle has just been published by Crisis Chronicles Press to celebrate his 72nd birthday. Find Gildzen at Arroyo Chamisa. John Burroughs (Cleveland) -- poems include "Cannot Believe William S. Burroughs Is Dead" and "Allen Ginsberg Wants You"
John Burroughs is the author of The Eater of the Absurd and numerous poetry chapbooks, and has been nominated for the Pushcart Prize. Since 2008 he has been editor/publisher for Crisis Chronicles Press; he co-founded the annual Snoetry Winter Wordfest. He performs his dynamic poetry throughout OH, MI, WV, and PA. His new book Beat Attitude (from NightBallet Press) will debut at BeatStreet Cleveland. Mad Anthony delivers "wicked dueling guitars and thunderous drums," "passion, unhinged energy and volume," "reckless abandon and relentless dedication," and "highly energetic songs with fun, quirky songwriting." Their newest cd is Sank for Days. Ringo Jones, Adam Flaig, and Marc Sherlock thrilled Cleveland in 2010 and 2011 with their sets at Lix & Kix, and are sure to blow the roof off any place they play. Check out BeatStreet Cleveland the blog for more details and updated information! Go HERE Stay tuned for exciting news as more poets are confirmed, and mark your calendars for this Very Special Event. Cleveland's heart will BEAT brightly with BeatStreet at the Barking Spider in September! We are at a party that doesn’t love us. Finally the party lets the mask fall and shows what it is: a shunting station for freight cars. In the fog cold giants stand on their tracks. A scribble of chalk on the car doors. I work the next morning in a different town. I drive there in a hum through the dawning hour that resembles a dark blue cylinder. Orion hangs over the frost. Children stand in a silent clump, waiting for the school bus, the children no one prays for. The light grows gradually as our hair. He had been nominated for the Nobel Prize every year since 1993, and finally won in 2011. The Swedish Academy said in its citation that Transtromer had received the Nobel prize “because, through his condensed, translucent images, he gives us fresh access to reality”. Transtromer was left partly paralysed after suffering a stroke in 1990, which made it difficult for him to speak, though he continued to write. Transtromer debuted at 23 with the collection Seventeen Poems, and later divided his time between poetry and his work as a psychologist. In famous collections such as the 1966 Windows And Stones, Transtromer used imaginative metaphors to describe the mysteries of the human mind, while his other work addressed nature, history and death. He is survived by his wife Monika and their two daughters Emma and Paula. One evening in February I came near to dying here. their lights – closed in. like a boy in a playground surrounded by enemies. The approaching traffic had huge lights. in a transparent terror that floated like egg white. they grew as big as hospital buildings. and scuttled smartly right over the road. flew away in the darkness. to see what had become of me. on the frozen Östergötland fields. I have not seen a single person. a special expression must develop. the sky, the shadows, the sand grains. and ten minutes in the evening. Everyone is queuing at everyone's door. 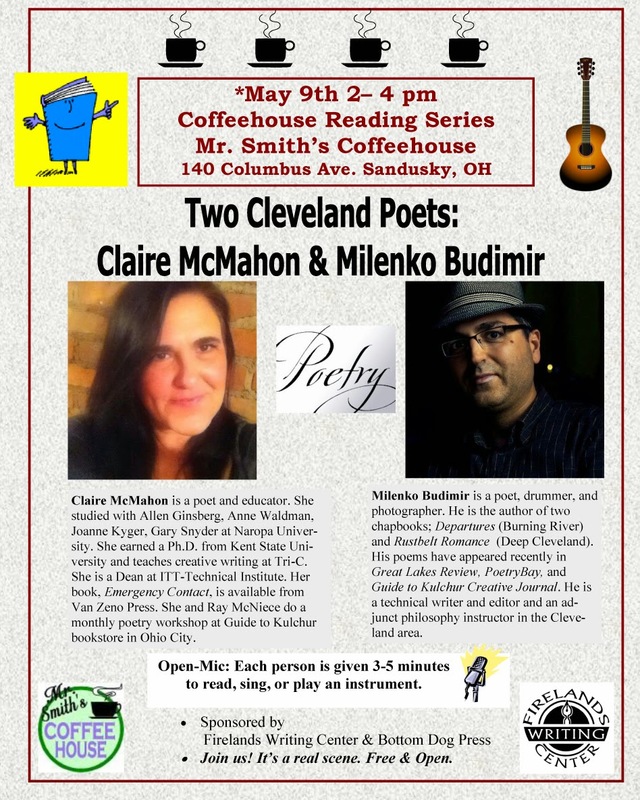 Come to Sandusky's Mr. Smith's Coffeehouse for a fine reading event. April is National Poetry Month, and for many poets — and a good number of poetry lovers and appreciators — it is a time to reflect on words and their beauty. There are a number of ways to participate in the celebration. The students of the poetry workshops offered by the Cleveland State University English Department come together for weekly classes to hone their craft and grow a greater love for the poetic word. Organizations such as Speak Up!, a monthly poetry slam held at the university hosted by the Black Studies Department, bring together poets of the spoken word to do just that — speak up. The many diverse voices you may encounter in the hallways of CSU or in the Black Studies Department are the backdrop for the amplification of the university's poets. As poets, we harmonize, and in the celebration of ceremony, turn verse to life and life to verse. For National Poetry Month, find a poetry reading on campus, and open yourself to a reality you may not otherwise encounter — for the word is life, and all young people seek life in some form or another. Try a poetry challenge — write a poem for each of the 30 days of April in celebration of the occasion, a feat of no meager means. Young poets have taken to social media to challenge their fellows to dedicate themselves in celebration of National Poetry Month. The challenge is to be vigilantly creative and steadfast to honor those poets who have done so throughout their careers — in the virtues of passion and discipline and little else. A daunting task turns into routine when one loves what one does. Some may be turned away by words. Some may be turned away by language. Some may be turned away by art. But what is more important is love — for poems and for those who write them. There is warmth in verses of poetry that is not found elsewhere in the realm of the arts. Be as it may, the task of the poet has been to introduce, inculcate and conclude one's journey through the arts. It is a lifelong journey for some — for others, it may simply be an interesting semester. This month, read Countee Cullen or Dylan Thomas, Saul Williams or Jack Kerouac. Read poetry.com. But you would be remiss not to read a poem this month. Find what you enjoy and indulge, for there is much on the other side of the cover of a book of poetry. And before you make it to the rear side of the book you will have breathed and blinked and grown and understood that there is much more to the written word than meets the eye. Celebrate a poem. Celebrate a poet. Celebrate National Poetry Month. Timothy Cox is a senior English major at CSU. Reprinted with permission of the editors. 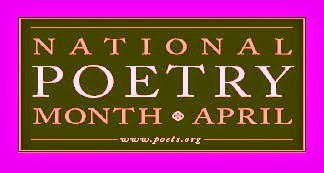 Are you having a great national poetry month? Are you following the Cuyahoga Public library's 30 Days of Poetry series, featuring 30 poems by 30 Northeast Ohio poets (today's poet: Jack McGuane), and challenging you to write your own 30 days of poetry? To celebrate National Library Week, we asked seven Stark County authors to loan the library a passage of a previously published work that touched somehow on the theme of libraries, librarians, books, and/or reading. We also asked each of them to tell us what libraries have meant to them. Each day this week we are featuring the response of one of those writers among whom are a historian, a journalist, three poets, and two fiction writers. You can come here daily to read their offerings. So, Do You Want a Challenge? It's National Poetry Month, and poetic challenges are coming thick and fast. If you want to write a poem a day, you shouldn't complain that nobody's challenging you! If we could make April Fool’s Day into April Sage's Day, how would it be celebrated? Write a poem of decrees for such a day. Today's word is: Agelast: a person who never laughs. Use the word in today's poem. --e-mail your poem to Writing Knights, or post your challenge poem to their facebook page. For today’s prompt, write a resistance poem. There are many forms of resistance, including militant resistance, resistance to new ideas, the resistance in exercise, and maybe even a little resistance to starting a new project. I hope you don’t resist the urge to write a poem today. --Post your challenge poem to the comments of Poem A Day. 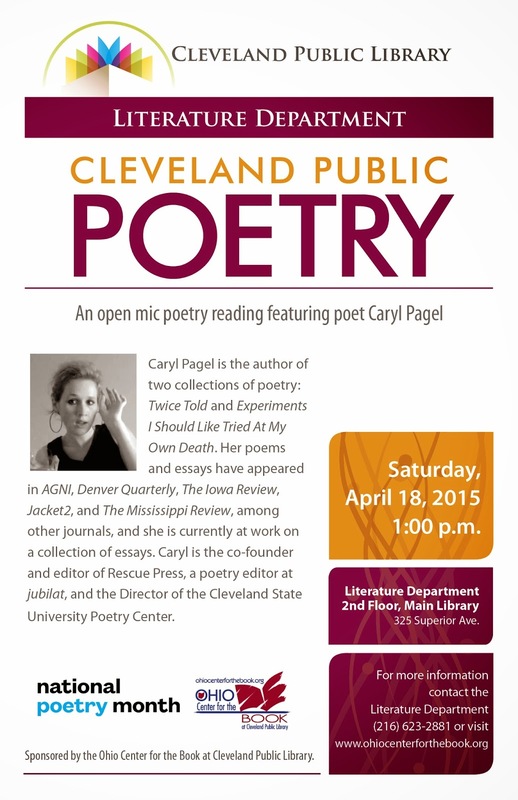 Today the Cuyahoga County Public Library starts their celebration of National Poetry Month with "30 days of Poetry"! along with poetry writing prompts. Or, sign up for to get their daily e-mail: to date, 1249 people have signed up to get the daily page! (That's even more than last year, when prizes were given away for signing up). AND there’s going to be a 30-days-of-poetry Open Mic at the Parma-Snow branch the last day, April 30th.